Where Joe Jackson is Keaton and Elvis Costello is Hanks. Alex Theoharides (@Minne_Pop) explains the frustration of watching Golden State's exciting young team. Look, I know how this is going to sound. When Domino asked me to write a biweekly NBA Team of the Week posting for Puddles, I took it as an opportunity to focus on one of the underreported teams in the NBA. You know, like the Milwaukee Bucks or the Phoenix Suns. Teams that don’t have a superstar and go unnoticed by coastal NBA fans unless they somehow end up on the NBA TV Game of the Week. But here’s the thing: this week, I’m focusing on the Golden State Warriors. Easy pick, right? The Warriors play in the 6th largest media market in the States. They were everyone’s NBA darlings last year, when they beat Denver and advanced to the second round of the playoffs. I mean everyone loves the Swish Brothers, right? I hate the Swish Brothers. I hate the Golden State Warriors. I hate David Lee’s smug face and perfectly coifed fauxhawk. I hated Mark Jackson when he was a fat point guard on the Indiana Pacers and I hate Mark Jackson even more now that he stands on his pulpit on the sidelines, coaching the Warriors as if they are a chosen team, destined for greatness. I hate how Steph Curry praises God after every made shot and how Mark Jackson said he was “praying” for Jason Collins’ family after the big man made the announcement that he was gay. As a Wolves’ fan, I hate how Andrew Bogut finds a way to stay on the court even though he’s broken seemingly every bone in his body. I hate how casually Steph Curry flicks three pointers high into the air, while the player the Wolves drafted instead of him, Ricky Rubio, can barely make a wide open jumpshot. I hate how David Lee dominates Kevin Love every time they’re matched-up. I hate how Harrison Barnes threw down a nasty dunk all over Nikola Pekovic’s face last season. I hate that Barnes is from Ames, Iowa and would have been a perfect small forward for the Wolves’ roster. I hate how cool the Warriors logo (the Golden State Bridge encircled by a basketball) looks on their royal blue uniforms. 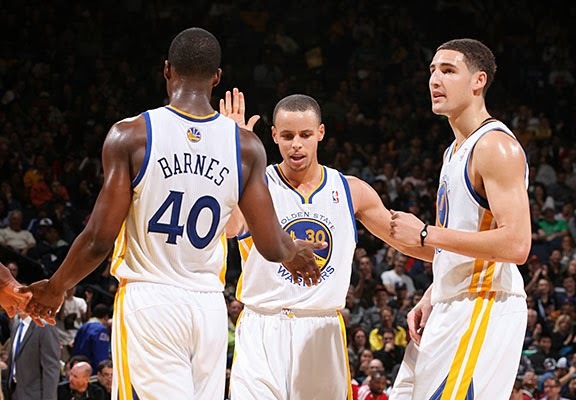 I hate the Golden State Warriors because right now they are one of the top four teams in the Western Conference. I hate them because they are the team I want the Timberwolves to be. I hate them because they are good. I hate them because they make basketball look easy. And I hate them because I really, really, really, hate David Lee’s face. The Orlando Magic are a well-balanced, exciting team. They have a legit chance to hover around the 8-seed in the East for most of the season. The worst team the Wolves have played is the Knicks, who don’t seem to know what kind of team they want to be. Also: What other owner doesn’t let the dancer’s dance? Let the dancers dance, James Dolan. Klay Thompson can play both sides of the ball and is an amazing shooter. It sounds crazy, but there’s a real chance he is a better all around player than Steph Curry. The most disappointing player I’ve watched is Kyrie Irving, who no showed his matchup with the Wolves. Andrew Bynum is slow and rusty as hell, but he is still a true 7-footer who can play basketball. This season’s Dallas Maverick’s roster might just kill Rick Carlisle. Anthony Bennett is the Rookie of the Year for the Ballers Who Don’t Have a Real Position in the NBA squad. Derrick Williams is the team captain. The worst player I’ve watched is Alexey Shved. Trust me, he’s just awful. The best player I’ve watched is Kevin Love. Dude is on a mission. At this point, he is a lock to make the All NBA Second Team. Feel free to e-mail me any comments, requests or questions about Puddles. The Relationship Room with Dr. Scales: Post-Coital Cuddle? Dr. Kerri Scales joins us once again for her Wednesday take on what works in a relationship and what doesn't. Pop Goes My Heart: David Stern Analyzes Gotye's "Somebody That I Used to Know"
Please make sure to click this button to add my blog to Stumble Upon so that more people can find the gems I am giving to you all. All website and blog content are Copyright 2008-2014 by Matt Domino. Powered by Blogger.